Hey DIYers! It’s been a while since I’ve posted on SimpleIOThings.com. About 2 years ago, I was tinkering with some hardware and trying to build some of the cool projects that were already out there on the web. I didn’t have a soldering iron at the time, or a breadboard or anything most tinkerer’s have. I realized there were probably other people like me who wanted to build some cool devices but didn’t want to have to set up a whole workshop. After a bit of trial and error, I had built a smart wifi button that didn’t need any soldering. After building a couple more projects, removing the hassles for programming sensor variables, and posting it here, I’ve been watching the site grow! And grow it has! If you do a Google search for “wifi button,” SimpleIOThings.com is consistently in the top 5 results! Not bad! 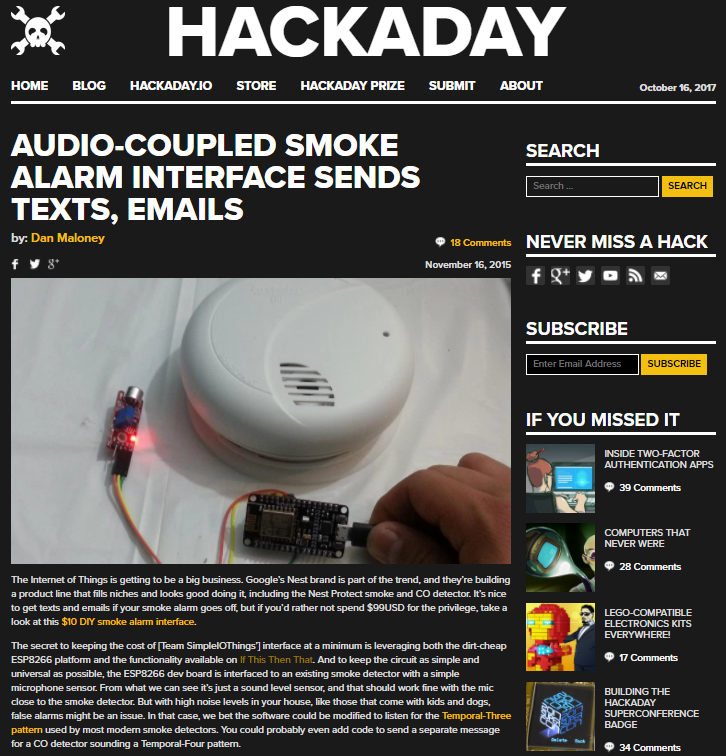 We’ve also been featured on Hackaday.com, and have a few articles on Hackster.io. I want to thank all you makers and builders out there who have been stopping by the page, building cool stuff, providing feedback (and SUPER special thanks for those of you who’ve bought me a beer using the donate link ;] ). It’s been great to watch this site grow and its all thanks to you, our readers. For some of you who have been with us from the very beginning, you’ll note there used to be two download files. One for the wifi button/sound sensor, and the other for the door sensor. Over time, we’ve tried to combine the all the sensor software into one download to make it easy for users (with mixed success; apologies to anyone that downloaded a buggy version of the code). I’m happy to announce that we have in fact gotten all the code to run out of a single zip file, and we’ve made some additions and reorganizing of the code to accommodate sensors that are triggered due to signal “interrupts,” versus those that are “continuously reading,” and then triggered by cumulative periods of time in a specific state. We’ll be writing more about these concepts in an upcoming article, but try the new software out, and keep in mind that there are additional .lua files included in the package. You can find the latest version in our Downloads page. Where’s the Netflix Button Article? Some long time readers may remember an article about sending a text to a Netflix viewing partner. We’ve decided to take it down to make the site more family friendly. We know that many people may want to try these projects with their kids, or in a classroom setting, so we’re keeping it PG now to make sure everyone can build & make without having to have “the talk” about birds, bees, and storks. If you really miss the article, send me a PM through the links at the bottom. That’s it for now, but we’ve got a few posts in the pipeline so stay tuned! Love your website. I am using your door sensor software to give me an alert when my garage door is open. Just wondering if there is a way to send a second alert to IFTTT when the door is closed again? Otherwise I was just thinking of hooking up another sensor and nodemcu. Thanks! There is definitely a way to have this done with one chip, but it would require some reprogramming. Since the code is heavily commented now, you may be able to reprogram to fire off an alert whenever a state change is registered on the GPIO pin. Another solution would be to have resistors setup on 2 different GPIO pins, and then connect them both to ground. When each of them registers a change, an IFTTT message could be sent. All depends on how comfortable you feel writing a few lines of script. Otherwise, with the existing software, you could use two different devices. One to tell you when the door is open, and the other to tell you when its closed. I would recommend using 1 “Open” reed door sensor, and one “closed” reed door sensor (built differently so that the electrical circuit is either open or closed when near the door sensor’s magnet).